While you might not exactly call me a “daredevil,” there's no denying that I do have a healthy appetite for adrenaline. There's a reason that I have been bungy jumping three times and why I have things like “swimming with sharks” on my bucket list. I like the rush. I like the challenge. And, I'll admit, you do automatically gain some cool points when you throw yourself off a bridge or out of a plane. But just because I enjoy things like zip-lining and whitewater rafting doesn't mean that I'm totally immune to the fear that often goes along with these activities. In fact, despite having done it twice before, I think it's safe to say that my third bungy jump was the scariest thing I have ever done. It was back in May, during my Blog4NZ trip around New Zealand. I was in Queenstown, the little southern resort town where adrenaline junkies like me go to get their fix. I love Queenstown. For being as small as it is, it certainly packs a punch — and that punch includes a ton of crazy adventure sports, from jetboating to skydiving to bungy jumping. I've bungy jumped before in Queenstown — off the 43-meter-high Kawarau Bridge, which is where modern bungy jumping was “invented” by A.J. Hackett back in the 1980s. 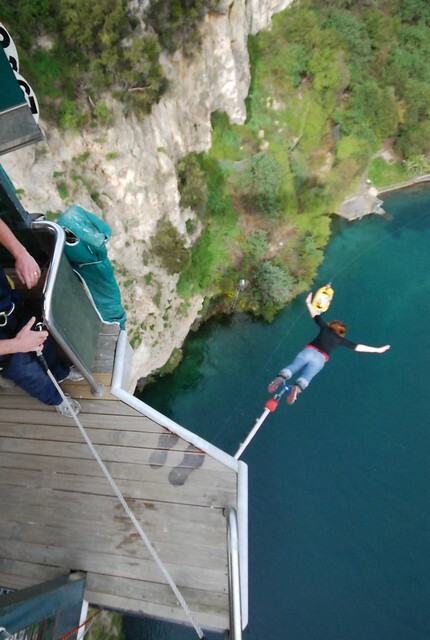 I've also been bungy jumping in Taupo, where a 48-meter-high platform offers up the country's tallest water-touch. Going for the water touch in Taupo! But kiwis — especially the adventurous ones — are constantly looking for ways to up the ante; to outdo their own craziness. A.J. Hackett, not content to have invented one of the world's more ridiculous sports and be operating in locations all over the world, dreamt up the Nevis Highwire Bungy. The Nevis Bungy, located in the stunning Nevis Canyon, is the mother of all bungy jumps. With a 35-minute backcountry 4×4 ride necessary to just get to the jump site, this is not a jump for the faint of heart. Or how about the fact that this jump is 134 meters high?? That's 440 feet. That's more than 40 stories. That's 3 times taller than the Statue of Liberty. I may not look scared, but I was terrified. I'm still not quite sure how I talked myself into doing it. But it probably had something to do with the fact that I had a free pass for both the Nevis Bungy and the Nevis Arc (a giant swing) as part of my Blog4NZ prize. Bungy jumping is NOT cheap, so to be able to do something like this for free was simply too good to pass up. After that, there was no backing out. Was I nervous on the ride out to the canyon? You bet. Was I scared riding in the cable car out to the jump pod? Absolutely. And do I still get butterflies looking at my bungy photos or watching my jump video? Umm, hell yes. But, once I was out in that pod and having my gear put on, I became strangely calm. This was just another challenge that I was going to overcome, and I knew I could do it. And, even though I seriously thought I might die as I penguin-waddled my way to the edge of the jump platform, I jumped obediently on the count of 3. Even though I've been bungy jumping before, nothing could have prepared me for the Nevis rush. Falling 134 meters is insane. You're going so fast that the breath is literally knocked out of you — I jumped screaming, but that scream was caught in my throat after about a second. Not to scare you, but I've heard of people actually blacking out on this jump because of the intense head-rush. … That's right, you have to pull on a cord as you're dangling bottoms-up in a canyon that releases your feet so that you end up in a sitting position in your bungy harness. Somehow, though, I survived. Actually, everyone who's conquered their fear at the Nevis has survived. So what did I do to celebrate? I went over to another platform, where I hung myself upsidedown in a giant swing harness 160 meters above the Nevis River and was launched in a 300-meter arc in the world's largest swing. The is unlike any other swing you've ever been on! Fun? YES. It would have been even more fun if I'd had someone to swing with me. Then we could have gone tandem in a compromising position like “Honeymoon” or “69” (yeah, use your imagination on that one…). So, bottom line, would I recommend these Nevis adventure sports to others? Absolutely. But be warned that it might be the scariest thing you will ever do. So what do you think? Would you try the Nevis Bungy or Arc? Disclaimer: I received a free pass for both the Nevis Bungy and Nevis Arc, care of A.J.Hackett, as part of my Blog4NZ prize package. But as always, all opinions are my own. Seriously awesome. My first bungy jump was at Taupo and I loved it. One of my trip regrets is not doing the Nevis but it just wasn’t in my budget. While Taupo was incredible, this looks even better. Oh well, it just means I have to go back to NZ and do this. Taupo (and the Kawarau for that matter) was a really fun bungy jump. Scary, but not terrifying. But the Nevis? I was scared for days before this one! Lol. But I think overcoming the fear here is the real reason why you do it. I’d definitely recommend it next time if you can squeeze it into your budget! Oh man. I give you super mad props for being able to do that. I’m pretty sure I was terrified just reading about it and then I got to the videos and they kind of blew my mind. I had considered bungy jumping before, mostly because one of my greatest fears is letting my life depend on a piece of rope, but I’ve been backing down from that idea for a few years now. The swing idea seems pretty cool though, so if I had to choose, I’d choose that one. It was definitely scary, but really fun and rewarding at the same time. I felt like a total badass after this! Lol. But I realize bungy jumping definitely isn’t for everyone. Looks amazing- absolutely no way I talk myself into something like that. You’re braver than I.
Haha, well, believe me, I DID have to talk myself into this one! I got so many butterflies just looking at this! You’re much braver than me….don’t think I could convince myself to do that, especially alone!! I STILL get butterflies looking at these photos, and watching my video. Sometimes I’m not quite sure how I did it. But I’m really glad I did. For such a height that was a graceful jump!! Looks terrifying. Thanks! I guess that’s what 8 years of gymnastics training gets you — a pretty swan dive. Lol. Girl you are crazy!! I am so scared of heights, I could never bungee jump, not even if I got it for free 😉 The Nevis Bungee Jump is something for serious adrenaline junkies. Would you do it again? This is definitely not for those who are afraid of heights!! It is also definitely one of the most crazy things I’ve ever done… so far, at least. Lol. OK. I’ve done a lot of mountaineering and rock climbing, with obligatory falling, and I’m *not* afraid of heights. That said, my hat is off to you – there is no way in the world I’d voluntarily do either of those activities. Free passes or not. And, honestly, I would have probably considered doing this eventually even if I hadn’t gotten the free passes. But, in this specific case, yup, the money was definitely a factor! Oh sweet Jesus I could never do something like that! You have all my admiration! Lol, apparently I am crazier than I previously thought! Wow, you’re a braver girl than I am. These pictures and videos make me nervous just looking at them. My stomach was in knots watching the videos! I think the most nerve-wracking part for me was the day leading up to the jump. I booked it 24 hours before I did it, and I think the anticipation was actually worse than the jump itself! Once I got out into the “jump pod,” I wasn’t so scared, because I knew I was going to do it. Imagine how terrifying it was to be standing there! Actually, though, thinking about it beforehand was worse. I just wrote a dutch blog about the Nevis. In a few months i’m off to New Zealand and it’s an once in a lifetime opportunity right? Maybe I just have to do it. Definitely a once in a lifetime type of activity! If you can work up the courage and the funds to tackle the Nevis, DO IT! My heart was pounding just reading your description! I’m not especially afraid of heights, but I am especially afraid of dislocating something that ought to stay located…Glad for you, though. Jumping off stuff holds no appeal to me, especially with the price tag that comes with it. That saying, if I had the opportunity to do it for free, count me in! I love trying new things and while I would never say never ever, I do prefer to keep close to the ground:-). I was scared just looking at the photos! But, it does sound truly amazing and it’s definitely a check on my bucket list that I want. Scary, but very rewarding once you face that fear and overcome it. I’m definitely glad I did it! Not on your life! I am so glad there are people like you in the world to do this so I don’t have to! Bravo! Haha, thanks, Angie! I’m glad this adventure has at least been entertaining (if perhaps a bit scary) for others, too! Wow – you’re brave, Akatuki! Just looking at these photos is giving me vertigo…wish I was brave enough to bungee jump. There were so many places to do it in NZ but we chickened out. 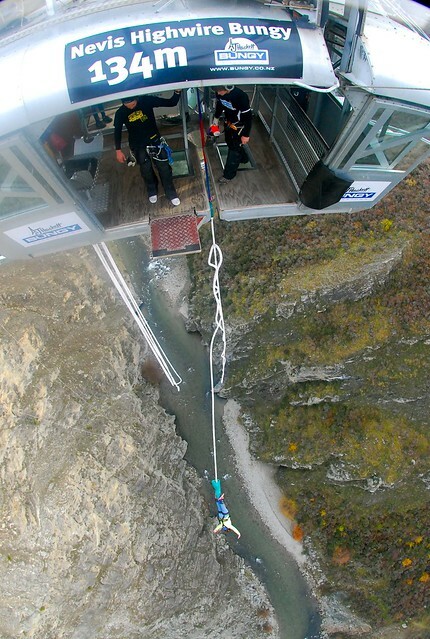 New Zealand definitely has a wealth of options when it comes to bungy jumping. But I know it’s not everyone’s cup of tea. I, however, am crazy enough to love it! That looks awesome. I can’t wait to go for a bungy jump! It was pretty awesome — but also really scary! But somehow I don’t think it would be quite as awesome if it wasn’t also scary! Good luck with your jump, whenever you do it! You wouldn’t be the only one to back out upon seeing the jump! I’ve seen quite a few people freak out and back out. But, I bet you could do it. The trick is not to think about it, and just jump blindly when they count you down! The longer you hesitate, the worse it gets. you are the bravest person I know! I wish I had some of your brave genes!! I’d be happy to loan you some, Jade! These adventure sports start to get really expensive after a while… lol. oh god you are crazy! haha I don’t know if I could do that ! I think I just got an adrenaline rush just from watching you! You might surprise yourself though, Cailin! I honestly didn’t know if I could make myself do this jump. But I did! Nope! Would NOT do this!! I had a dream last night that I went bungee jumping and that was enough for me. Props to you though-and anyone else that does this stuff. No way, no how for me! However, I would gladly have gone with you……..but only to take pictures! Haha, are you SURE? 😉 At least you’d go watch! My mom wouldn’t even do that when we were in New Zealand together. Lol. Haha oh no! You probably shouldn’t watch it a second time then… I wouldn’t want to be the cause of any heart troubles! Wow, you looked so calm! I can’t imagine walking up to that platform and looking over the edge. But, I’d like to try bungy jumping some day too. 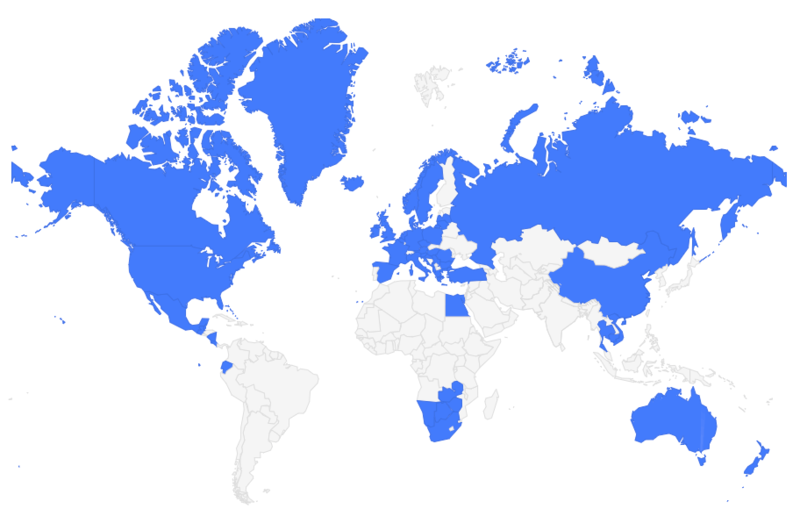 Apparently NZ is the place to do it! If you think you may only ever do it once in your life, New Zealand is DEFINITELY the place to do it! And believe me, I wasn’t really feeling that clam at all standing up there! Dude, I like to consider myself fairly adventurous, but you actually couldn’t pay me $10000000000 to do this. I am in complete awe over your bravery! Holy feck! Well, considering I know how terrified of heights you are, I suppose I can understand you never wanting to do anything like this… haha. Looks absolutely amazing! A few years ago I bungee jumped and went sky diving in Taupo New Zealand. But I imagine the 134 m jump is way more of an adrenaline rush! The Nevis is MUCH more of a rush than the bungy in Taupo! Though, any bungy jump is scary… But I’ve done both Taupo and the Nevis (as well as another shorter jump in Queenstown), and the 134 m jump was most definitely the scariest! But also the most rewarding afterward, I think. It was most definitely a challenge. A terrifying, awesome challenge. So worth it, though!! Wow… I’m just scared just looking at this…. You know what? It even scares ME a little bit to look at these photos and watch the videos now! Just a little over a year later I’m in NZ and I just did this! Thanks for being my inspiration! Wow. No, I wouldn’t try it, because I’m sure I would die of heart attack mid-bounce. 🙂 And even if the odds of a catastrophic accidental plunge to your death are miniscule, why tempt fate? You are obviously much braver than I am! Haha, maybe my subconscious has a death wish? Wow. I love giant swings, so I definitely want to do the Arc! It’s the mother of all giant swings, that’s for sure! Really fun though. Oh my gosh. Never would I ever!! We were just talking about our bungee jumping experience last night. The setting wasn’t nearly as beautiful as yours (it was over a huge swimming pool in South Korea) but just as scary. We were only hooked up by our legs and was terrifying! Don’t know if I’d go that route again. Your photos are awesome and there’s one where you’re in mid air and it doesn’t look like you’re hooked up to anything! Crazy! The Nevis was perhaps the most intense and terrifying thing I have ever done. And yet it was also SO fun. Bungy jumping over a swimming pool sounds a bit odd… there’s one spot in NZ you can jump basically over a car park, though, so I suppose there are weirder locations! Lol. I have wondered a couple of times – what safeguards do they take to ensure someone suicidal doesn’t just jump by when not tied in, and do a one-way jump? Makes sense. I’m sure that they are at least slightly concerned about suicides, while mostly being concerned about people doing immensely stupid things before they’re safetied! Forgot to mention that this is exactly what I think of when I think of bungee jumping. The rope breaking and landing in croc-infested water with my feet tied together! Or rather, that’s why *you* don’t go bungee jumping over croc-infested rivers. It’s why *I* don’t go bungee jumping at all! More seriously, it’s amazing that gal came out if it with little more than a truly adrenaline-laden experience. She’s one lucky girl…. It really is amazing that she had no major injuries. You are, of course, totally correct, and I was more joking than anything else. Nobody should use this accident as a reason not to try it if they are so inclined! While I’m not inclined to bungee jump it’s not because I’m afraid things will go wrong – I just prefer to get my adrenaline in more active ways. I’ve come close enough to dying in the mountains and white water kayaking to suit any adrenaline junkie. And I’ve fallen enough times rock climbing to be totally “over” any feelings that could be construed as positive when it comes to the sensation of falling! I’m fifteen and we’re going on a holiday to new zealand towards the end of this year, argh i want to go bungy jumping,i’ve never jumped before but i love adrenaline things, haha but i’m scared but i know i’ll regret it if i don’t do it . It will be fun, I think i’m going to queenstown or i could go to the shotover one. I don’t think i can quite do the nevis yet, what’s the first freefall part like? Oh how exciting!! That will be a really fun holiday. And, if you like adrenaline activities, you definitely should try bungy jumping! It truly is a rush. For your first time, one of the best places is the Kawarau Bridge in Queenstown — it’s where modern-day bungy jumping was born! Plus, it’s a very memorable spot. The Nevis is definitely terrifying, I won’t lie. Lol. The freefall at Nevis is intense! Crazy long (like 8 seconds), and takes your breath away. If you’re a little scared about it, I’d definitely suggest a more tame jump for your first time! I’ve yet to do that…was it fun? Beautiful scenery. It’s a challenge and an absolute adrenaline rush. Not sure if I’d call it “fun,” because I was terrified for about a day beforehand, but it was absolutely worth it in the end! I always considered trying bungy jumping at some point in my life, but high places aren’t exactly my favorite places. I figure if I’m going to face my fear of heights, then I might as well go all out and just try skydiving. I’ve actually heard some people say buggy jumping is scarier than skydiving! Mostly because you’re more aware of the height when buggy jumping, and you physically have to do the jumping yourself, as opposed to being strapped on to someone else. I definitely think bungee jumping is scarier! I went sky diving and bungee jumping (video of it on our website) over the course of 2 days in New Zealand and definitely found bungee jumping to be much scarier – mainly as you said because with bungee you actually have to push yourself off as opposed to sky diving where the instructor just lets you know hes going to push out of the plane and you have no choice in the matter! Had a heart attack watching your arc! Can imagine how great – is that the right word? – you might feel afterwards having conquered your fear though. And the adrenaline rush. You are so brave! I couldn’t do it!! The adrenaline rush and feeling of accomplishment afterwards are amazing – better than any drug anyone could ever take! oh my.. just reading that made my palms sweat and once I got to the videos my heart was racing. I have a bungee jump in a month or so in Cairns, Australia. I am having nightmares about it already. Not certain why I am scared, however from my experiences I am scared of heights but that scare is relatively mild. However, I am very concious and scared for my safety and I think thats where both phobias come in to haunt me in the run up to this bungee jump, making me wonder wether I will back out last minute. Well I hope you go through with it, Alex! You’ll feel really accomplished if you do! 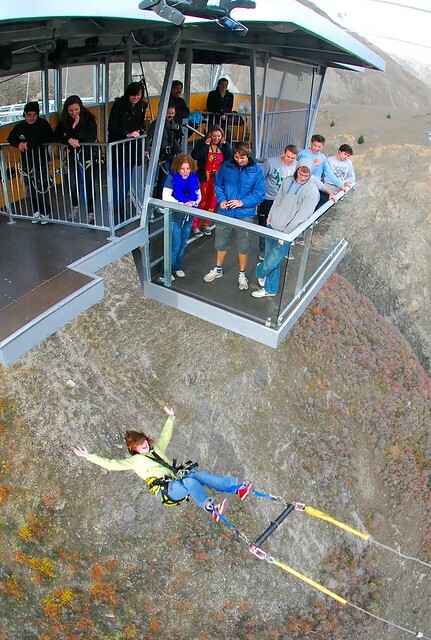 We’re planning to do this bungee jump during our visit to Queenstown in a few weeks. I’m already terrified! Props to you for having done it! I think I’ll be shaking too hard to pull the “foot cord”. Is it difficult? I’m slightly afraid that I’ll unhook the wrong thing and go pummeling back towards the ground. Yipes! It’s really not that hard – and don’t worry, you can’t pull the wrong thing! I hope you have an awesome time!! 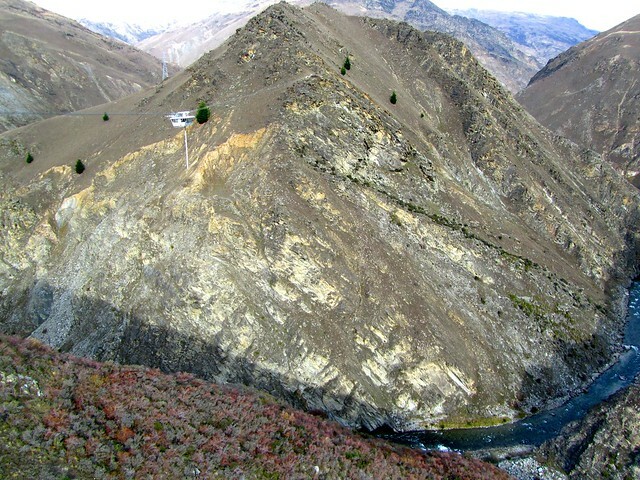 Im heading over to Queenstown soon, and I’m weighing up doing either the nevis swing/shotover canyon swing OR a bungee jump (either nevis or somewhere else). Which would you recommend in terms of fun adrenalin, value for money, overall, etc? Hmmm I would actually suggest keeping your eye on a website called bookme.co.nz – you can find last-minute discounts on EVERYthing there, and especially for activities in Queenstown. I got a great deal on the Ledge bungee last time I was there! 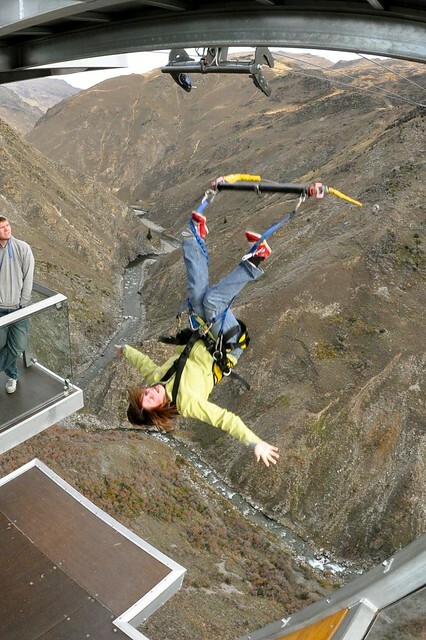 I would definitely recommend a bungee jump since it was invented in Queenstown and is definitely an adrenaline rush! I just booked Nevis bungy, wish me luck hahaha!! love your post!! Good luck, Paola! It’s an adventure you’ll never forget! I realize this is an old blog post but I just came across your site about a week ago and can’t stop reading everything. I could never ever do this, not even for free. Although I wish I was an adrenaline junkie because I know I’m missing out on a lot of fun. I read this article and the comments few days ago before trying the bungy at Nevis. I saw that no one comes back to tell how their experience was. I hope it will be helpful for others. At 3 I just jumped. I am happy that I did it. The fall is crazy amazing. You feel like flying. I don’t try to advertise it, but if you are into adrenaline just go for it. I have done before skydiving in tandem, but there you are like a spectator. The other person does everything for you, you just stay nice and look around. Here instead need “to grab your heart with your teeth” and jump. I have always been afraid of the moment when the cord ends and you go for the second fall (when seeing others ), but I felt just a slow touch on my legs – most probably due to the adrenaline. Another think that I was afraid was not to have any consecuences after. I have been totally fine after, even if I am quite a big girl ( I am really fat, that is also why I was first in my group to jump). Glad to hear you had a great experience! It’s such a rush and definitely not for everyone, but you definitely feel on top of the world if you go through with it!